Contract workers generally face greater health and safety risks than permanent employees, and OSHA is increasing efforts to protect them. The temporary nature of contract work assignments makes it less likely that a temporary worker will be adequately trained, and many times this means they are not fully aware of the job hazards and risks. A 2012 fatality of a 21-year-old temporary worker at a Bacardi Bottling Plant in Florida, who died on his first day on the job, exemplifies the problem. Lawrence Davis was cleaning glass under the hoist of a palletizer machine when another employee started the machine, crushing Davis beneath it. In that case, OSHA charged Bacardi with failing to train Davis on proper lock out tag out procedures and fined the company over $100,000. In 2013, OSHA announced a temporary worker initiative to begin monitoring the safety and training of workers from temporary staffing agencies. When companies outsource their operations to independent contractors, who are not classified as employees, who is responsible for their safety training? Is it the staffing agency? Or the company that owns the site where the employee is working? Determining who is accountable for safety training can be challenging when work is outsourced. But OSHA has published guidance on this issue. "Host employers need to treat temporary workers as they treat existing employees. Temporary staffing agencies and host employers share control over the employee, and are therefore jointly responsible for temp employee's safety and health. It is essential that both employers comply with all relevant OSHA requirements." 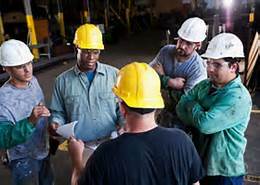 The temporary staffing agency and the host employer should set forth their responsibilities for compliance with any applicable OSHA standards in their contract. This will avoid any confusion and will ensure compliance. Staffing agencies and host employers are jointly responsible for maintaining a safe work environment for temporary workers. This includes making sure that OSHA training, hazard communication and recordkeeping requirements are met. Because the temporary staffing agencies and host employers share control over the worker, they are therefore jointly responsible for temporary workers' safety and health. Each employer should consider the hazards it is in a position to prevent and correct. For example: staffing agencies might provide general safety and health training, and host employers provide specific training tailored to the particular workplace equipment/hazards. Communication is important between the staffing agency and the host employer to make sure the workers are protected. Staffing agencies have a duty to inquire into the conditions of their workers' assigned workplaces. They must ensure that they are sending workers to a safe workplace. Staffing agencies need not become experts on specific workplace hazards, but they should determine what conditions exist at their client work sites, what hazards may be encountered, and how best to ensure protection for their temporary workers. The staffing agency has the duty to verify that the host employer has fulfilled its responsibilities for a safe workplace.